Graves Park 362-5, Pinchbeck 78-5 (declared) - Graves Park won by 284 runs. Graves Park secured a comfortable 284-run success against Pinchbeck in the South Lincs and Border League Cup. 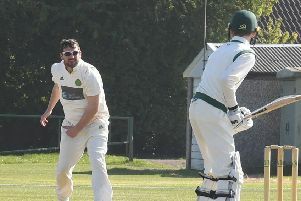 Chris King struck 137 to top score for the Park men, with support coming from Jack Ashton (63), John Morris (38), James Luto (29), Mitch Griffiths (26), Liam Maskell (20 not out) and Joe Gilbert (17 not out). After Pinchbeck openers Nick Crook (37) and Matt Kidd (28) were dismissed, no further Pinchbeck player made it beyond four runs, the team declaring on 78-5. On Saturday Graves Park host Spalding Seconds in the SLBL Division One (1pm).